To justify context to stack mapping I should really show you the costs of using contexts instead of just waiving my hands and referencing the Green Book (thanks Glenn, Stephane and Addison Wesley!!). That means profiling a VM. Unless you’re a prescient genius you don’t have a hope of producing a faster VM unless you can accurately profile the one you have and figure out what has to change. OK, yes, to an extent we can all now be prescient geniuses because fast Smalltalk and Java VMs have already been built and one can read the papers about them. But it still helps convince one’s employer, for example, when one can point and say "Look, there, I told you so. Contexts are slow!" ranges. A scale value of 0 disables profiling. 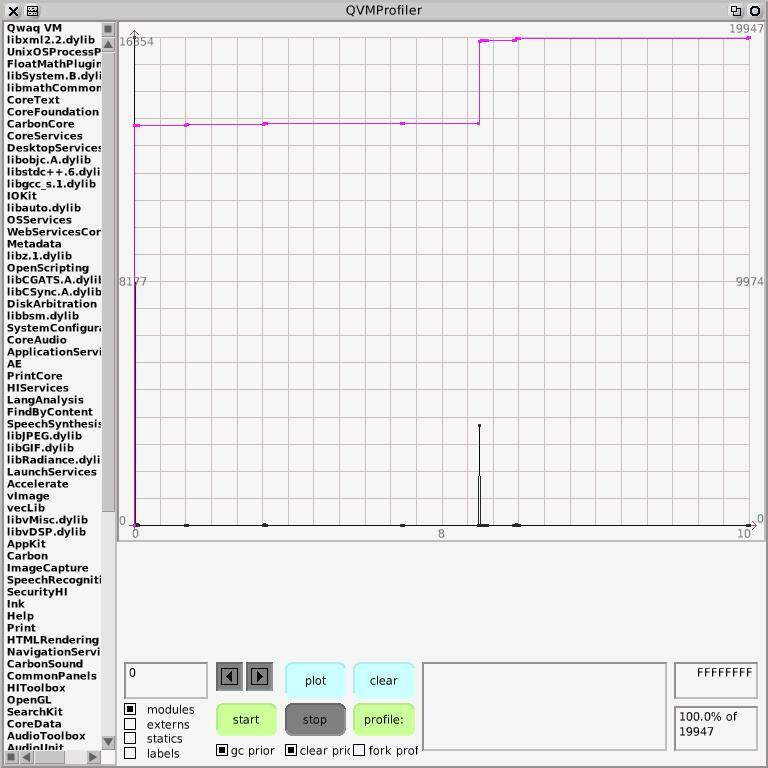 The C library provides a wrapper around this called moncontrol(3) which will take care of allocating the right size buffer and dumping it to a binary file called gmon.out. 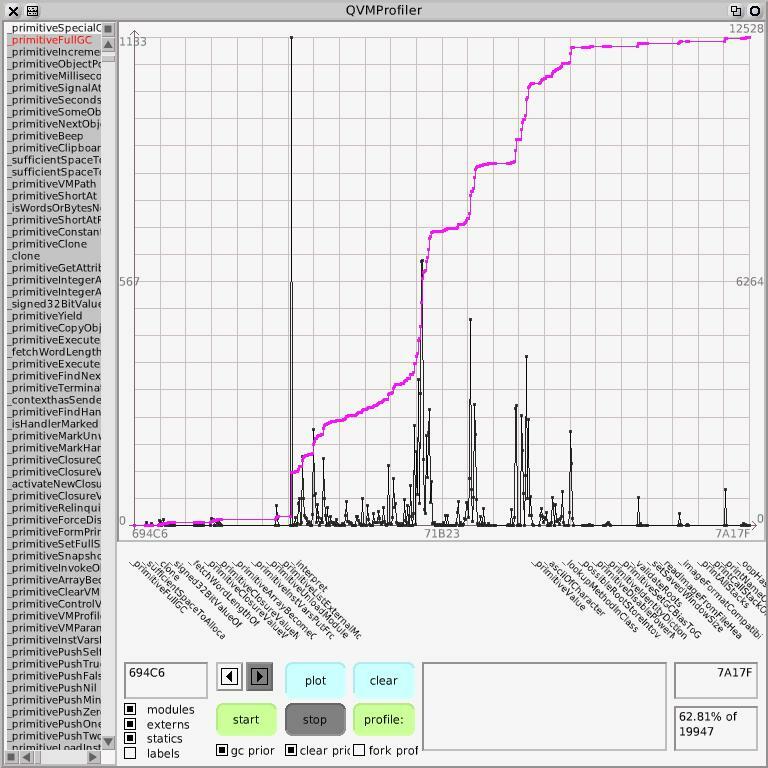 Delightfully simple, it is really nice when one displays the histogram as a graph; then ape-descendents such as myself can actually spot the expensive parts of the program because they’re where the line goes to the top of the page; something I find much easier than reading tables of numbers. 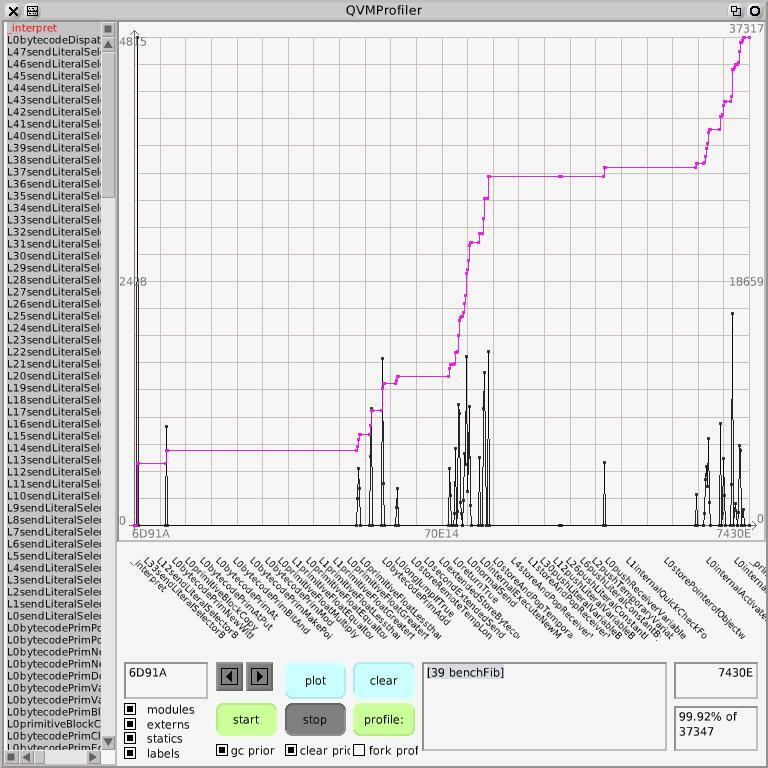 For something as simple as a Smalltalk virtual machine a call graph profiler really doesn’t tell you much you don’t already know. The VM is essentally flat and doesn’t contain many really interesting algorithms. It is simply an engine and what you need to know are what regions are creating internal friction. All very well. 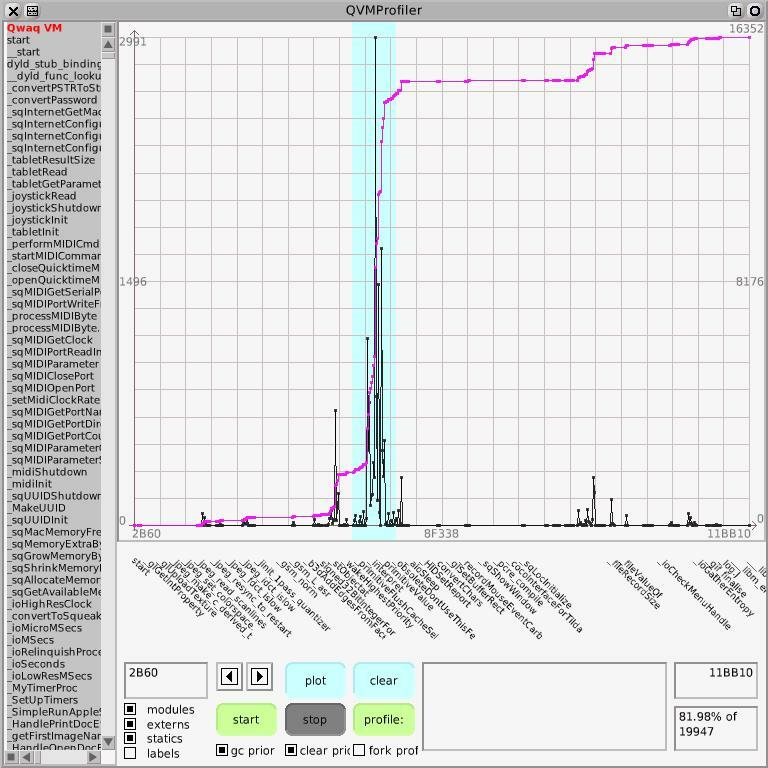 Using ones own machinery the histogram bins can be 32-bits in size, relieving one of the anxiety that, at 64k samples per bin, a tight loop might overflow a bin or two. Wrap this kind of machinery up in a few primitives and you write an interactive VM profiler in Smalltak that will allow you to profile interactively. Adding some support for getting the addresses of native code the VM generates one can also profile the running system, not just the VM itself. Because a VM like HPS actually relocates and discards generated code you can move the profile data to match and hence profile the VM over long periods of time even when it is moving native code around. Neat. My VisualWorks/HPS profiler had one histogram for the VM and a separate histogram for the generated code. HPS generates native code to a fixed size region it allocates at startup. I alloated a few bins in the profile to hold samples tat fell outside of these two histograms so I could know if time was being spent elsewhere even if I didnt know where. This was fine for optimizing the virtual machine and its generated code, and that was my obsession, so all was well and good. When I started on the Cog VM at Qwaq I made the mistake of plowing ahead, assuming I knew how to make a faster VM, and starting on a VM that mapped contexts to a more-or-less conventional stack organization, a la HPS (more, much more, in a subsequent post). When this VM didn't perform as well as expected I had to do what I should have done in the first place and implemented my third VM profiler. But the Qwaq VM is just a small part of a large substrate of C-level libraries which support the Qwaq Forums 3D virtual world. There is the Open GL library and sound libraries and a number of external plugins and on Mac OS X nearly 90 other libraries in the entire application substrate. Above the VM lives the Smalltalk code that is the brain of the application but the body beneath has a complex metabolism that it is my job to get into better shape. The problem is that this is crap. 8k resolution is not up to much. You can't tell whether the huge spike in the middle of the C library accounting for 13% of entire execution time is a call on select or a call on strcpy. Hmph. Luckily finer minds than mine have evolved significantly further from their ape ancestors than I have and have figured out that a histogram at the lowest level is an idea that has run its course. 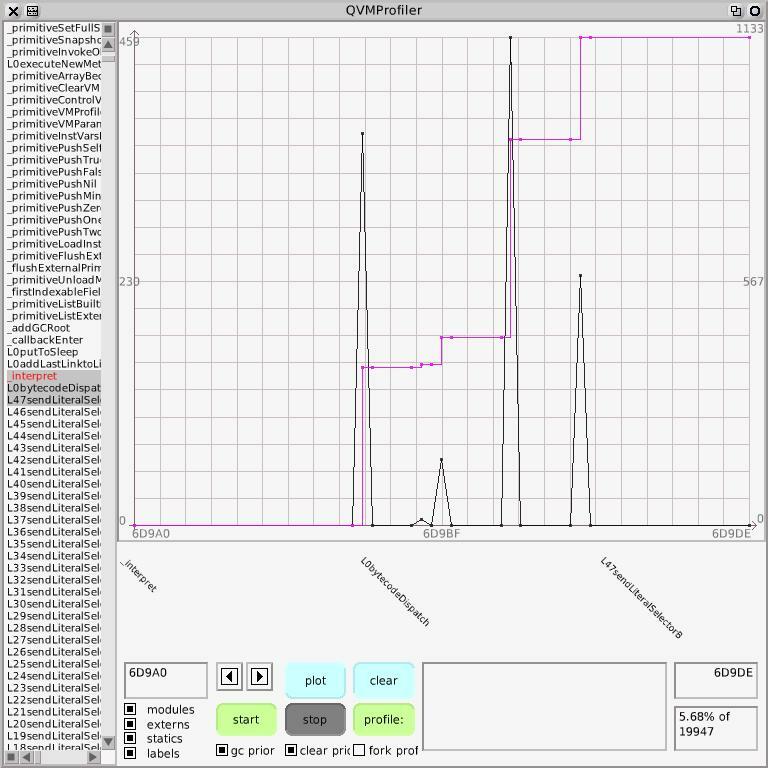 If you look at dtrace and Shark these tools are based on a buffer into which are written pc samples. Instead fo the low level machinery maintaining the histogram it merely saves the samples. The size of the buffer and the sampling frequency determine for how long one can profile. 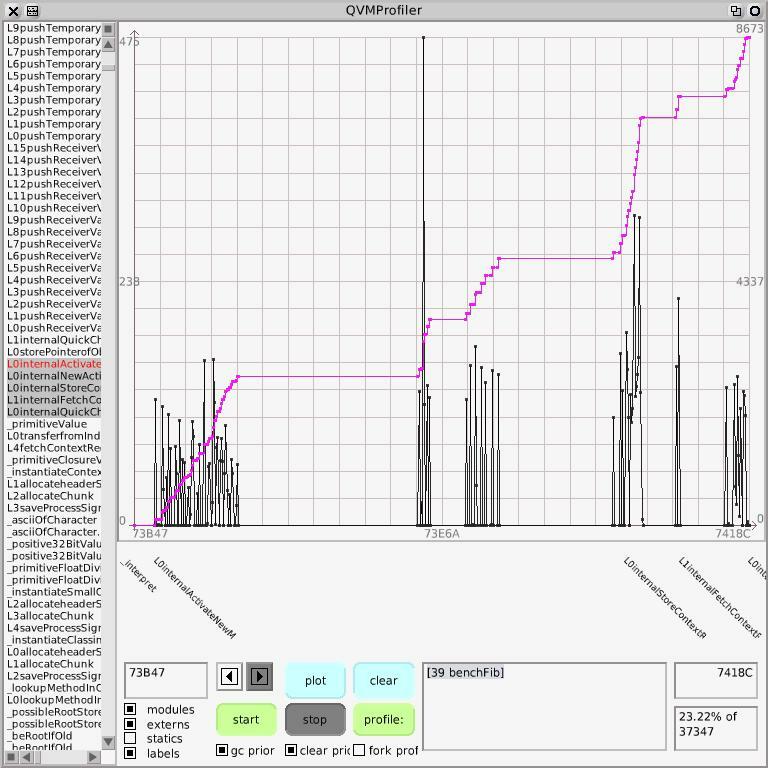 Organize the buffer as a ring and one can record the samples for the immediate past, simply overwriting old samples if the buffer is smaller than needed for the profiled period. With the sample buffer approach the low level machinery is simpler, for example, one doesn't need to determine the start and end address of the VM, and the resolution is perfect throughout the address space. If one does a little arithmetic (something me and my friends in Gombe find harder than we should) one finds that the memory requirements are quite reasonable. Five minutes of 32-bit samples at, say 1 KHz, is 4 * 5 * 60 * 1024 = 1228800 bytes, which is a lot more economical than the histgram approach. The sample buffer is a pay-as-you-go approach. A profiling blue pill. Provide a bigger buffer and profile for longer. The histogram approach is simply stiff. Stiff as in "late Dent, Arthur Dent". Of course no profiler, no software, is perfect. Arguably one of the hallmarks of software is its infinite perfectibility; Microsoft software being transfinitely perfectible. Long may it remain so as I've still to save for my retirement. [Do you think your employer won't catch on that you're permanently postponing putting out the perfect product? ed.] But this one's a substantial improvement on its predecessors. * Example of 2meg buffer (512k samples) gives nearly 6 minutes of profile. "Use a SparseLargeArray so we can apparently have a sample per pc in the entire address space"
lowResolution := 16 * 1024.
lowResSamples := Array new: (2 raisedToInteger: 32) / lowResolution. highAddress := lowAddress := minSelectionIndex := maxSelectionIndex := 0.
total := rangeTotal := startTime := elapsedTime := 0.
gcPriorToProfile := clearPriorToProfile := true. [sampleBuffer := Bitmap new: self profileSize]. pc := sampleBuffer at: i.
highResSamples noCheckAt: pc put: (highResSamples noCheckAt: pc) + 1.
lowResSamples at: pc // lowResolution + 1 put: (lowResSamples at: pc // lowResolution + 1) + 1]]. Labelling the graph is easy on Mac OS X because the Objective-C runtime is richly introspective and provides convenient access to loaded libraries. One wants to be able to find the currently loaded libraries, because a rich application like Qwaq Forums may load libraries dynamically and so simply listing the libraries the VM is linked against, e.g. via otool -L (otool(1)) or on other unix systems ldd(1), won't provide the full picture. One then needs to extract the symbols from the libraries, and possibly relocate them if the library has been relocated at load time. On Mac OS X, as declared in /usr/include/mach-o/dyld.h, _dyld_present() answers whether the dynamic linker is in operation, _dyld_image_count answers how many loaded libraries there are, _dyld_get_image_name answers the name of a library given its index, _dyld_get_image_vmaddr_slide answers the relocation, _dyld_get_image_header answers a library's in-memory header and getsectbynamefromheader answers a particular segment in that header. It is a bit of a mouthful but the following plugin answers an Array containing the name, relocation, address and length of the VM and each loaded library. The major complication is that any allocation mght invoke the garbage collector and move things so the Array result needs to be kept on the stack instead of referred to from a local variable. relocation in memory, the (unrelocated) start address, and the size." present := self cCode: '_dyld_present()' inSmalltalk: [false]. nimages := self cCode: '_dyld_image_count()' inSmalltalk: . resultObj := interpreterProxy instantiateClass: interpreterProxy classArray indexableSize: nimages * 4. "Easier keeping the damn thing on the stack than using pushRemappableOop:/popRemappableOop. Where is topRemappableOop when you need it?" start := size := -1. "impossible start & size"
name := self cCode: '_dyld_get_image_name(i)' inSmalltalk: . slide := self cCode: '_dyld_get_image_vmaddr_slide(i)' inSmalltalk: . h := self cCode: '_dyld_get_image_header(i)' inSmalltalk: . [s := self cCode: 'getsectbynamefromheader(h,SEG_TEXT,SECT_TEXT)' inSmalltalk: . [start := self cCode: 's->addr' inSmalltalk: . size := self cCode: 's->size' inSmalltalk: ]]. indexableSize: (self cCode: 'strlen(name)' inSmalltalk: [name size]). interpreterProxy storePointer: i * 4 ofObject: (interpreterProxy stackValue: 0) withValue: valueObj. nameObjData := interpreterProxy arrayValueOf: valueObj. self cCode: 'memcpy(nameObjData, name, strlen(name))' inSmalltalk: [nameObjData]. valueObj := interpreterProxy signed32BitIntegerFor: slide. interpreterProxy storePointer: i * 4 + 1 ofObject: (interpreterProxy stackValue: 0) withValue: valueObj. valueObj := interpreterProxy positive32BitIntegerFor: start. interpreterProxy storePointer: i * 4 + 2 ofObject: (interpreterProxy stackValue: 0) withValue: valueObj. valueObj := interpreterProxy positive32BitIntegerFor: size. interpreterProxy storePointer: i * 4 + 3 ofObject: (interpreterProxy stackValue: 0) withValue: valueObj]. resultObj := interpreterProxy stackValue: 0. This is then accessed through a symbols manager that insulates the graphical tool from the platform-dependent label derivation. all loaded libraries) and the vm address relocation, if any, is for the module." ';nm -n -f "', module name, '" | grep -v " [aAU] " >"', module shortName, '"']. symStream := (Array new: 1000) writeStream. [[proc isComplete] whileFalse: [(Delay forMilliseconds: 25) wait]]. symtab := StandardFileStream readOnlyFileNamed: (tempDir fullNameFor: module shortName). line := (symtab upTo: lf) readStream. address := self hexFromStream: line. shift ~= 0 ifTrue: "avoid large integer arith if poss"
[address := maxAddressMask bitAnd: address + shift]. public := line next == $T. ifFalse: "first non-text symbol marks the end of the text segment"
symbolsByModule at: module put: symStream contents. This is one of those infinitely perfectible pieces of code I was alluding to earlier. There is hackery I'm hiding from you here. Parsing all those symbol files takes some ten seconds with the current VM on my mac and it is tedious to wait for the profiler to parse before opening. So all the parsing is done in background processes. 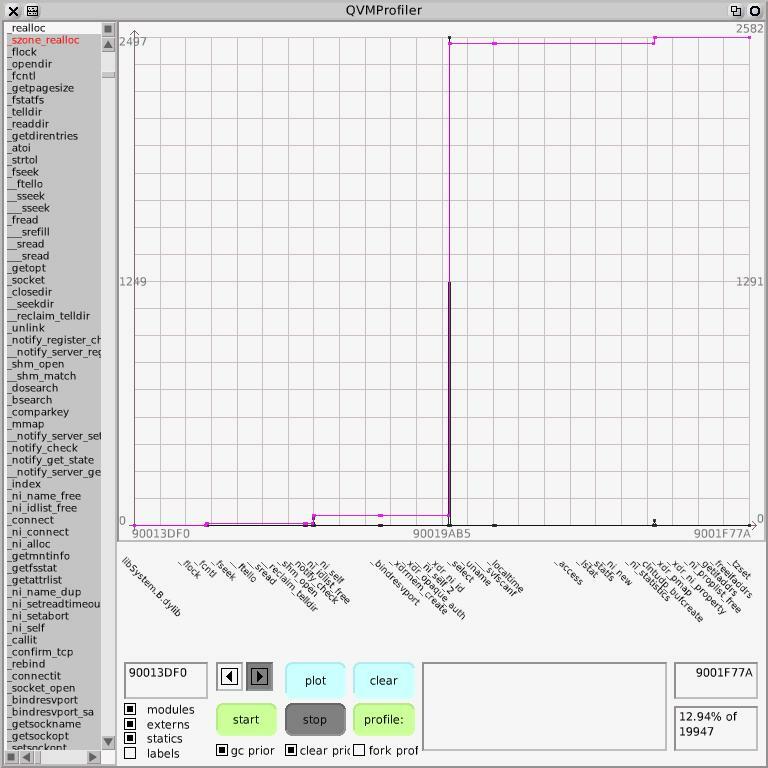 The profiler opens immediately displaying only the list of modules. By the time one has recovered one's composure after beholding the wonder of the profiler the symbols have been parsed. With the symbols parsed into QVMSymbol objects we can create a list of symbols in address order, a dictionary of symbol name to symbol and produce the list of symbols to the left of the graph. 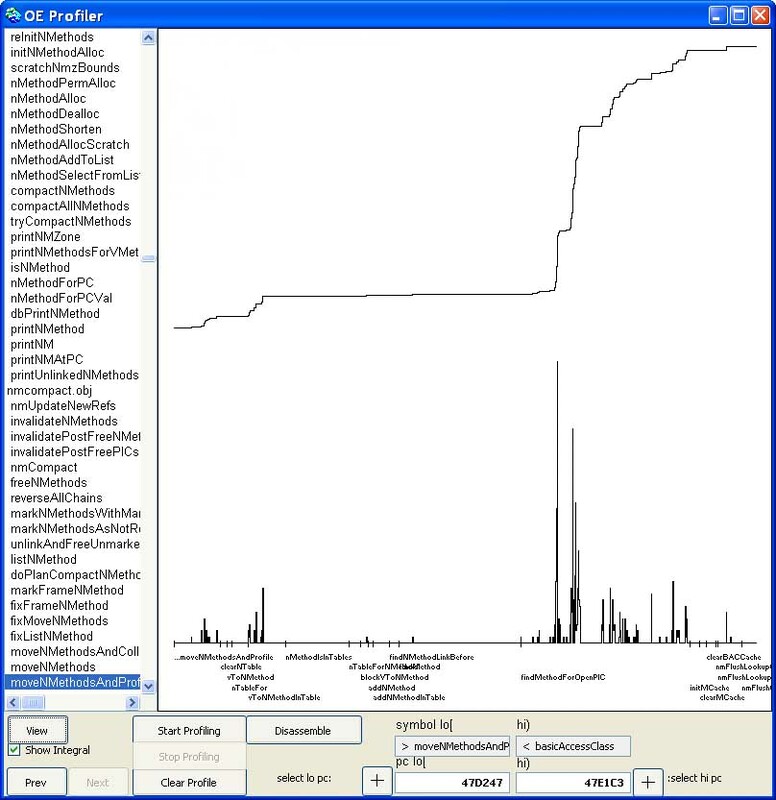 The black line is the graph of the samples where the height indicates the number of samples per bin, where a bin is some range of pcs that depend on the current scale of the graph. Zoom in and the pc range per bin gets smaller until one can see individual pcs corresponding to individual instructions. 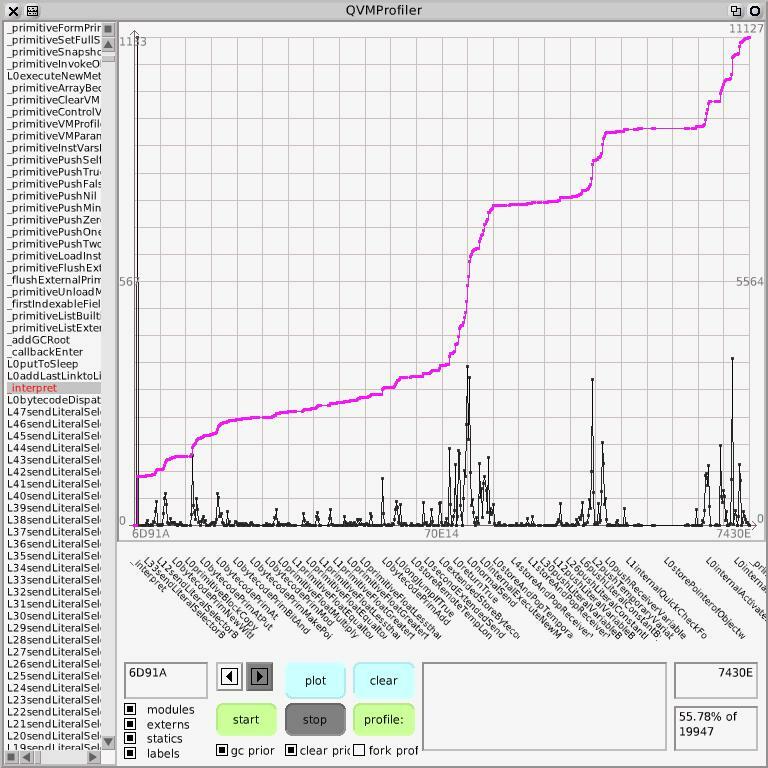 The pink line is the integral of the histogram over the currently displayed range of pcs, so it always starts at bottom-left and, if there are any samples, ends at top-right for 100% of the samples in the current range. In the bottom right-hand corner you can see the proportion of the total samples this range represents, 81.98% of the total number of 19947 samples. On the right of the graph is the integral's range and 16352 / 19947 is indeed about 0.8197724 or there abouts. On the left is the histogram's range, so the highest spike contains 2991 pc samples. Let's zoom in to look at where the integral's gradient and height are highest; that's where the time is going. I can select using the mouse; that's the blue stripe. And of course it's the interpreter, whose main function interpret is very large and very costly. doesn't help much in locating the pig's stomach. Drawing Number One and my Drawing Number Two. "(result // seconds to run) = approx calls per second"
t := Time millisecondsToRun: [r := 26 benchFib]. (r * 1000) // t"
"138000 on a Mac 8100/100"
So what does e.g. 39 benchFib look like in the VM? to activation/return for a grand total of 30.03% of entire execution time. The cost here is contexts. For every send a new context must be allocated, and, adding insult to injury, the receiver and arguments must be copied from the caller context to the callee context, something that a stack organization eliminates. But that's for the next post. Happy new year! Posted by admin on Tuesday, December 30th, 2008, at 8:59 pm, and filed under Cog. Thank you so much for the gory details. I’ve always used the histogram approach, so I appreciate you blazing the trail on where to go next. One thing I have been wondering recently is whether one could get a performance improvement by ensuring byte code arrays were unique (in the way that Symbols are). If all the “return instance variable #n”, “set instance variable #n”, and other common byte array patterns existed just once each, and were compiled to native code just once, that surely would help performance. Perhaps you would have to impose a size limitation on that, so that only “small enough” methods were managed this way. I suspect the “byte code array” would get replaced by a more elaborate structure which also includes some kind of link to the native code with the null pointer or whatever telling the JIT compiler this method needs to be JIT compiled. I remember being asked this at ParcPlace, where to an extent it was a standard question to ask of new members of the team. Your idea has two sides. One is as a space saving technique, the other as a jit performance technique. Let me take the former first. It doesn’t apply to Squeak which has Blue-book compiled methods which are half literals half bytecodes and hence don’t have a separate byte code array to share. But it does apply to VisualWorks and other Smalltalks where a method’s byte codes are (at least notionally) stored in an instance variable. It turns out that in VisualWorks at least the idea doesn’t fly because there is another optimization for small methods. In VisualWorks methods with 6 or less bytecodes have them encoded in two SmallIntegers, up to three bytecodes per integer, the first integer living in the bytecode instance variable, the other being an extra literal. Because of this in VisualWorks your idea would apply only to methods of 7 bytecodes or more and by that time there is already such variance that the uniquing table occupies more space tha n it saves. But I’m sure your idea would hold water for systems that have distinct byte code arrays but don’t do the bytecode compression technique that VisualWorks uses, e.g. because the system mixes an interpreter with a JIT or is just an interpreter. The second side of your question is, um, complex to discuss and I hope to get to it in a blog post on the jit. One of the complications is having to record teh selector for any send site so that when methods are discarded or redefined send sites can be unlinked. Suffice it to say that doing things like architecting polymorphic inline caches so that accessors can be stored there-in achieves what you’re aiming at in a slightly more general way. 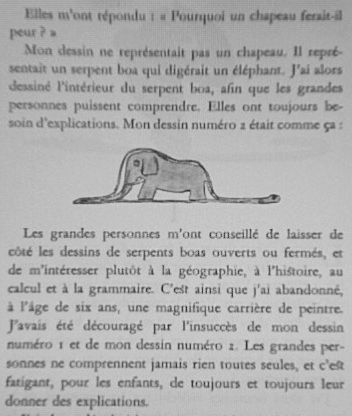 PICs can also optimize message-not-understood and, as I plan to do in Cog, interpret-method. David Simmons does a lot more with PICs; something I hope he will write about some time. I plan to do accessors, MNU and interpret-method. I forgot to say that st/x does not do bytecode compression; instead, a separate bytecode instvar slot is present in both blocks and methods (in addition to the code-ptr slot, which is filled in by the jitter or preset by the stc-generated dll-code). When a send is unlinked the selector is retrieved from the target method. So I can’t simply make call sites invoke run-time routines. I’d have to change the code to e.g. so that the selector is always available. But wait, Claus, can you go into more detail? Are you only using these routines for getter/setter calls that are statically bound? If not, what happens when the class check fails? Where is the selector obtained, etc?